I recently asked members of the FB community if they would like to ask the Westboro Baptist Church any questions directly. There were many questions, too many for anyone to respond to thoroughly. 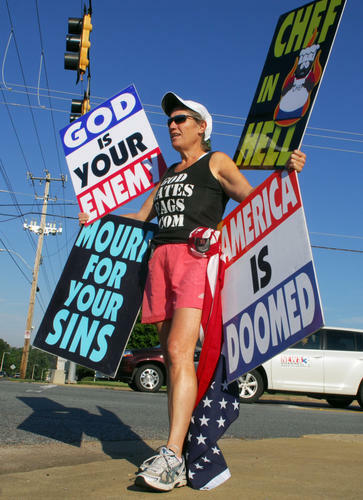 So Shirley Phelps -Roper, daughter of Fred Phelps, and member of the Phelps family most prominently featured in the film – sent a response to the first question asked. My agreement with her was that I would post her answer, unedited – which I have done below. Some may ask if I’m merely giving the WBC the opportunity to use my film and site to “spew their hateful idealogy”. The answer to that question is “yes”. Although I would rephrase it as, “I’m giving the WBC the opportunity to express their belief system.” Why? The first step in dialogue is to listen. No matter the message. If we aren’t willing to listen – we can’t dialogue – and if we can’t dialogue then there can never be understanding. Period. So I have posted the following below, for an opportunity for understanding. For those of you who only read “hateful idealogy” I’m sorry. And for those who say, “They don’t want to understand me”. It doesn’t matter, try to understand anyway. QUESTION FOR WBC: Does God punish innocents for the immoral deeds of their peers? Begin with this: NO INNOCENTS! Second, YES! We are all guilty! If you do not love your neighbor, one of the requirements for being acceptable before God, you get your own GodSmackin! Matthew 22:34 - But when the Pharisees had heard that he had put the Sadducees to silence, they were gathered together. Leviticus 19:17 Thou shalt not hate thy brother in thine heart: thou shalt in any wise rebuke thy neighbour, and not suffer sin upon him…but thou shalt love thy neighbour as thyself: I am the LORD. You better warn your neighbor that his sin is taking him to hell! If you don’t do that, God’s word for it, you hate your neighbor in your dark, evil heart! Mark 16:14 - Afterward he appeared unto the eleven as they sat at meat, and upbraided them with their unbelief and hardness of heart, because they believed not them which had seen him after he was risen. THAT my friends is what WBC is doing! God is confirming our words everywhere and always! We told you now for 20 years, every single day on your streets, IF YOU GO THE WAY OF SODOM, you will suffer her fate! You went the way of Sodom, no, your destruction is IMMINENT! Trying to hook this humble little flock of slaughter up with murdering brute beasts won’t change that, it will only hasten your trouble!